Fur coats were not worn only by women. During the 1920s, a fad for bulky raccoon fur coats swept college campuses, particularly the Ivy League schools of the Northeast. Warm and relatively inexpensive, raccoon coats were worn during sporting events and for motoring in open vehicles. A supporter of this fad was football player Red Grange, aka The Galloping Ghost. This 1925 photo of Grange wearing a raccoon coat at an outdoor football game documents the style. As you can see in the image above, the fox fur collar is quite deep and thick. 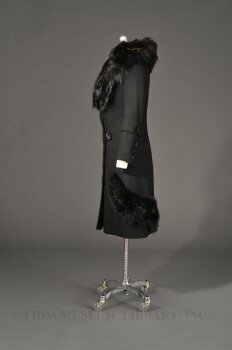 In 1929, a fashion reporter for the Washington Post noted, "as fur-collared coats make their appearance...to go with them [are] tiny, close-fitting hats. "2 In other words, the thick puffiness of the ubiquitous fur collar made it impossible to wear anything other than a cloche. (If you're not familiar with the cloche, you can find examples from our collection here and here.) Though it is tempting to try and pinpoint whether the cloche or the thick fur collar came first, what's more interesting about this quote is the reminder that dress and accessories develop in conjunction with each other. 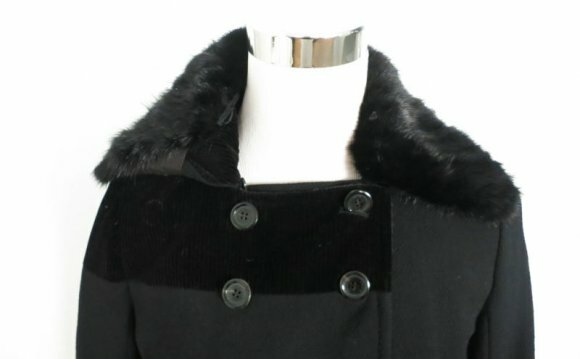 The fox fur trim wrapping around the lower portion of this coat curls in a way reminiscent of a fox's tail. Totally removed from the animal itself, the fur maintains only the faintest relationship with its origins and becomes simply a decorative element. Another style of fur popular in the 1920s, the whole animal fur stole, contained tangible reminders of the animal it once was: claws, eyes and teeth. In his A/W 2001 collection, provocateur Alexander McQueen referenced (mocked?) this fashion by showing a golden animal skeleton wrapped around the neck of a model dressed in a tuxedo-like coatdress. 1 "Varied Furs Used in Winter Wraps." New York Times 30 Oct. 1927: X14.